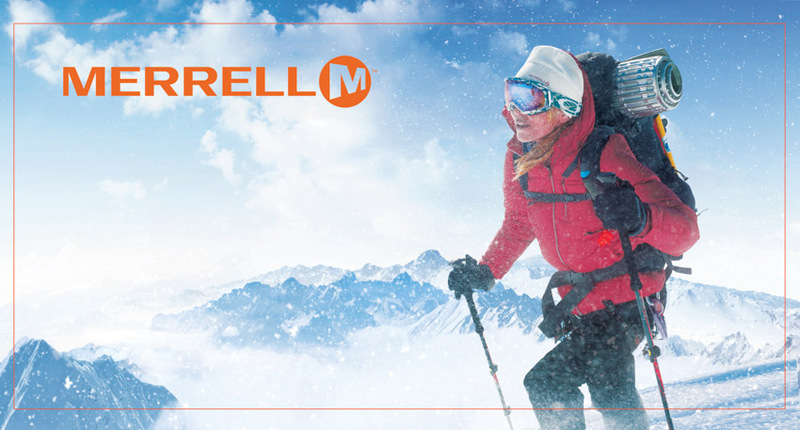 Assignment Photos: Merrell Winter, for Sportmaster Ltd. Earlier this year I shot an assignment for my Moscow based client, Sportmaster Ltd., who is the leading sporting goods retailer client in Russia and eastern Europe. 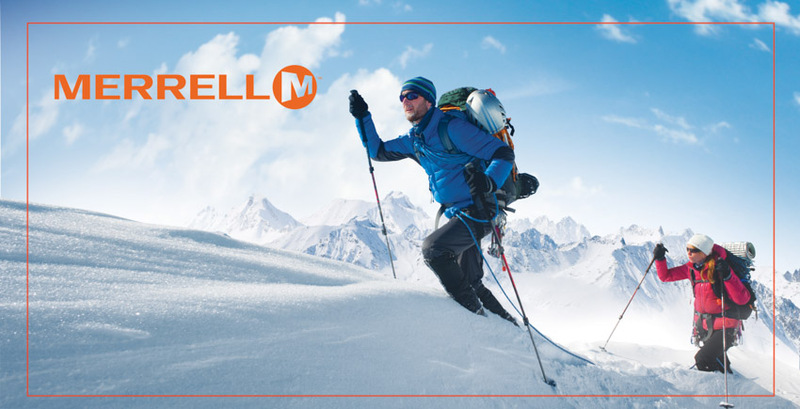 Sportmaster is official dealer of a number of outdoor brands, including Merrell, who was one of the brands that we shot during this job. 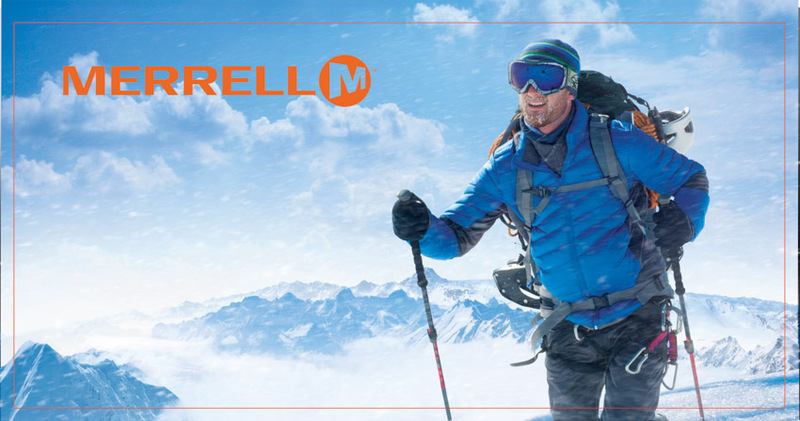 The images we made during the Merrell winter brand shoot were designed to portray the kinds of extreme conditions and mountaineering activities that Merrell outerwear is designed for. They’ll primarily be used for the website and in-store displays. This was a large scale production that was run through Assassin’s Creative, a Los Angeles Ad Agency, and it was just one of the locations and brands that the entire job entailed covering. 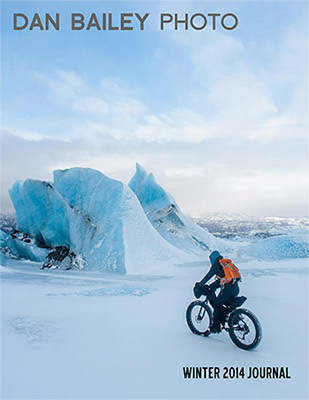 From a photography standpoint, I felt that it was the quintessential job for me, as it required a high degree of technical, action adventure photography skills and equipment that would withstand extreme conditions, as well as the outdoor skills and gear to comfortably move around in this kind of mountain environment. For most of these scenes, I used a Nikon DSLR and the 24mm f/2.8D wide angle lens. I’ve always loved the 24mm for shooting adventure subjects, because it’s wide enough to show environment, but not too wide that it blows out perspective too much, and it doesn’t distort very much at the edges. It’s a camera combo that I’m highly familiar with and comfortable using in any kind of setting, and I figured for a large scale ad agency production, I’d go with with what I know best. I also brought along my Fujifilm X-T1, which I had just started using, and it also saw heavy use during the course of this assignment. I’m very excited about the way these images came out. To me, they accurately represent the kind of environment and extreme look the client was going for. When I compare them to the initial comps that the art directors showed me during the preproduction phase, I feel that we nailed it. 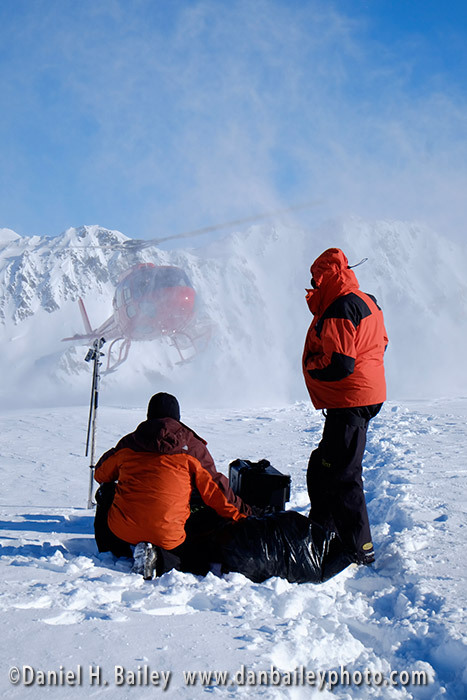 Of course, one of the coolest aspects to the shoot was the helicopter ride to the location! Anytime you’re getting paid to ride in a chopper, you’re having a very good day. 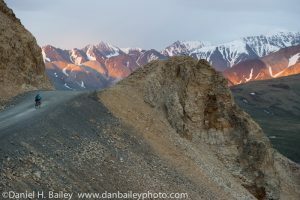 I just finished shooting a week-long assignment for a new client here in Alaska. 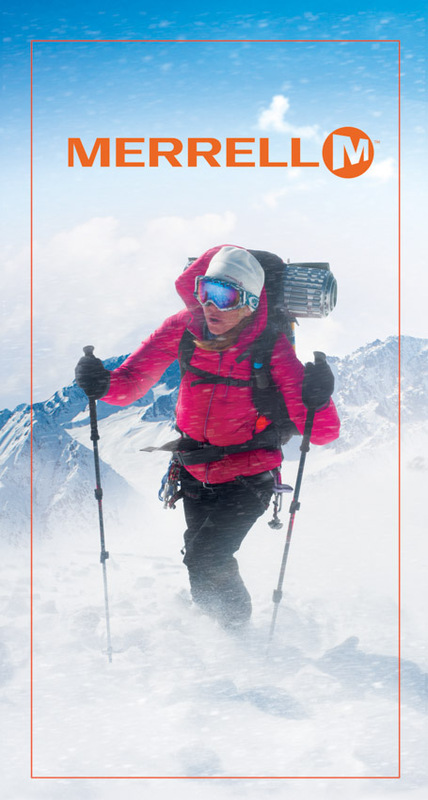 The job involved a variety of challenging locations, weather and subject matter that ranged from fast action, outdoor lifestyle, portraits, running kids, extreme mountain terrain, and a host of other photographic situations that pushed both my skills and my gear. Of course, I took along my Fujifilm X-T1, figuring that I’d shoot it side by side with my Nikon D700. It seemed like a perfect opportunity to further test its capabilities in a very high demand assignment situation where weather, speed, image quality and quickly changing conditions were all huge factors. 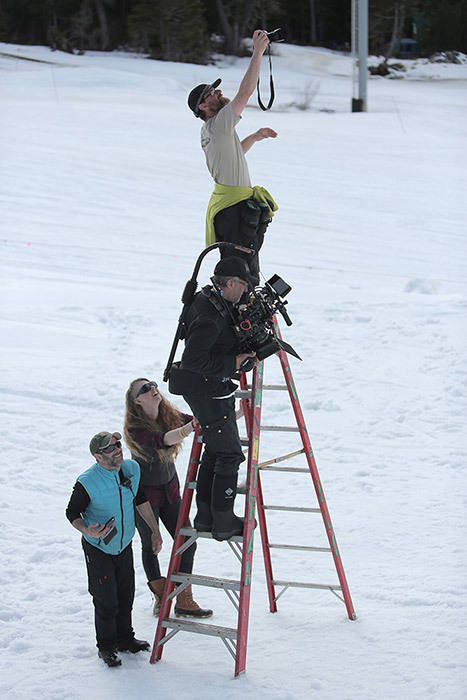 Halfway through the first day, we were shooting a scene where the helicopter was hovering and blowing a virtual snowstorm around me and the subject, and that’s when my D700 failed. First time ever. I got an FEE error message, which means that the camera stopped communicating with the aperture ring. I was suddenly unable to use any of my D-series prime lenses, which make up 80% of my glass. I’m thinking that water seeped in underneath the aperture ring on the body, which is odd, because the D700 is supposed to be weather sealed. I shot by looking through the EVF 90% of the time, but the tilt screen proved incredibly useful for a number of the low and high angle setups, and the Continuous 8 fps was perfect for shooting the action scenes, as well as capturing quickly changing expressions on the lifestyle and portraits. For some shots, I triggered off-camera flashes and a battery powered strobe using a PocketWizard in the hot shoe, and it worked perfectly. I used facial recognition focus for some scenes and shot quite a few of the scenes in manual mode, making quick, on-the-spot exposure adjustments with the aperture rings on the Fuji XF lenses. Overall, the X-T1 performed like a true, job-saving champion during the entire week and I’m incredibly happy with the photos. I shot everything in RAW and the only limitation I found was when using slower memory cards during extended bursts of 8 fps. I’ve got a 240MB/S card, which never slowed down. My older 30 and 45 MB/S cards ran into buffer clogs and sometimes took up to a minute to write a fast 8 fps series, but this has nothing to do with the camera, it just means I need to get some faster cards. The X-T1 is designed to take advantage of the new UHS-II format SD memory cards, like the SanDisk Extreme Pro 280 MB/S card, which is now shipping. For still subjects and short bursts, slower cards work ok, but when you’re running frame after frame in CH mode, the new faster cards are essential. Even the SanDisk Extreme Pro UHS-I 95 MB/S card would have made a big difference over my older cards. For lenses, I made heavy use of the XF 14mm f/2.8, the XF 18-55mm f/2.8-4 and the awesome new XF 56mm f/1.2 short telephoto portrait lens. All three performed flawlessly and the combination covered all my bases. The art director and few people on the production team were very impressed with how nimble I was with my lightweight camera setup, which definitely helped keep things moving during a very tight shooting schedule. We planned 5 days to shoot everything, and got it all done in 4. Producers like this, because on a big production like this, one day can save thousands of dollars. Most importantly, the clients are extremely happy with not only my imagery, but how fast and adaptable I was with my gear. Hopefully this means I’ll get the call again. To me, all of this reaffirms even more that the Fuji X-T1 is indeed a professional grade camera capable of shooting a top outdoor, action and adventure photography assignment, because that’s exactly what I did with it during the past week. Even after putting it to extensive use during the past two months, this was the was the first really big job that I’ve shot with the X-T1. I feel as if I’ve gotten to know that camera even better now and am even more confident with how well it performs in all situations. If you haven’t seen my full review of the X-T1, you can find it here. Support this site: The Fuji X-T1 is shipping now and you can show your appreciation for the time and effort that it takes me to compile and write all of my articles and reviews by purchasing through the links below. It won’t cost you anything extra and it helps keep this site running. Thanks so much! You can now read the Winter 2014 issue of the Dan Bailey Photo Quarterly Journal, which is now out on virtual newsstands everywhere. 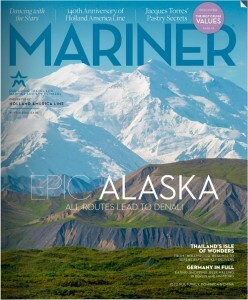 This latest issue features recent tear sheets, a collection of new work and it highlights one of my recent photography assignments. 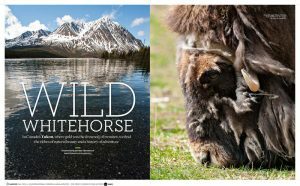 It also contains information about my latest eBook, ZEN PHOTOGRAPHER, and my upcoming Alaska Photo Workshops, which will be starting up this summer. 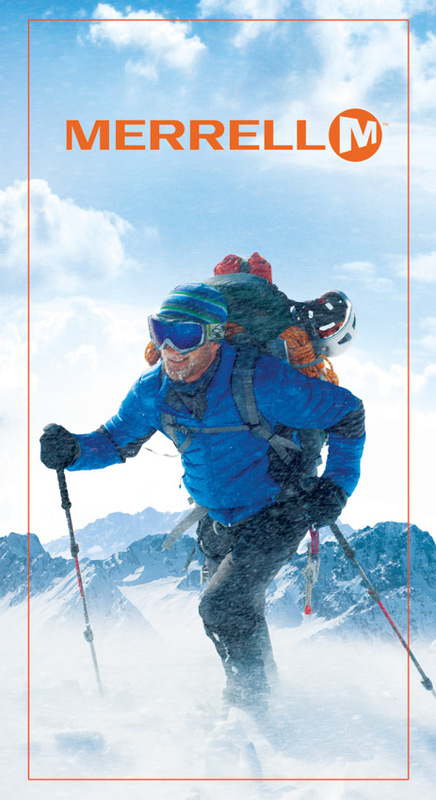 Check out my Winter 14 Journal here, or download it to read later. It’s a relatively small PDF file, and you can even view it on your smartphone or mobile device. It’s a great way to stay updated about the kinds of work I’m shooting lately, see who’s using it and get to know me a little better. Feel free to share this journal and thanks for reading! The 18″ Lastolite Mini Trigrip: Even More Portable!